Not a good start to the year. While futures are off earlier lows, the S&P 500 is poised to kick the year off with a decline of more than 1%. The culprit behind today’s weakness is poor economic data out of China and Europe. On the US front, things have been quiet…so far. With futures indicating a decline of about 1.65% at the open, today’s start to 2019 could go down as the 16th time that the S&P 500 has kicked off a year with a first day decline of more than 1%. You may recall that the last such occurrence was in 2016 when stocks kicked off the year falling by 1.53% on the first trading day. The rest of that year wasn’t so bad as the S&P 500 went on to rally 11.24% from the first day’s close through year-end. That 11.24% advance also just happens to be the median rest of year gain that we have seen following prior years when the S&P 500 fell more than 1% on the first trading day of the year. Besides 2016, the next two most recent occurrences where the S&P 500 fell more than 1% to kick off the year weren’t as friendly to the bulls. 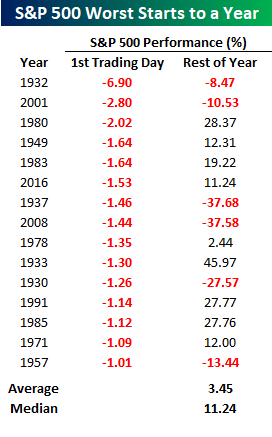 In 2008, the S&P 500 dropped 1.44% to kick off the year and proceeded to fall another 37.58% through year-end! Then, back in 2001, the S&P 500 kicked off the year with a decline of 2.8%. Following that sharp drop, the FOMC announced a surprise 50 bps rate cut from 6.5% down to 6.0% the very next day. Back then when rates were above 6%, the FOMC had plenty of more ‘ammo’ to ease further, but in the end, it didn’t seem to help as the S&P 500 fell another 10.5% through year-end, and the economy peaked and fell into recession in March.